Fernández-Bautista, N., Domínguez-Núñez, J. A., Moreno, M. C. and Berrocal-Lobo, M. (2016). Plant Tissue Trypan Blue Staining During Phytopathogen Infection. Bio-protocol 6(24): e2078. DOI: 10.21769/BioProtoc.2078. In this protocol plant tissue is stained with trypan blue dye allowing the researcher to visualize cell death. Specifically this method avoids the use of the carcinogen compound chloral hydrate, making this classical method of staining safer and faster than ever. The protocol is applied specifically to detect cell death on Arabidopsis leaves during the course of infection with necrotrophic fungus Botrytis cinerea. One of the most common methods to detect dead plant tissue is trypan blue staining (Keogh et al., 1980). This diazo dye is also used in histology and medicine to measure tissue viability through allowing the visualization of cell death1 (Keogh et al., 1980; Cooksey, 2014). Most microscopic procedures involving trypan blue staining require a long subsequent clearing step using chloral hydrate (CHL), a small organic compound currently used such as a carcinogen, an anesthetic and an analgesic in laboratory animals (Keogh et al., 1980; Lu and Greco, 2006; Salmon et al., 1995). CHL is not approved by the FDA in the USA or the EMA in the European Union for any medical indication (http://www.accessdata.fda.gov/). Only 250 mg or 50 mg of choral hydrate are sufficient to produce adult or pediatric sedation respectively, and its toxicity has also been measured in neonatals (http://www.drugs.com, Salazar et al., 2009). The LD50 (median lethal dose) for an adult is estimated to be a 4-h exposure to 0,440 mg/L vapour concentration, which is also the duration currently recommended for de-staining of plant leaves at a concentration of 250 g/100 ml. Long-term use of chloral hydrate also results in a rapid development of tolerance to its effects and possible addiction, as well as adverse effects including rashes, gastric discomfort and severe kidney, heart, and liver failure (Gelder et al., 2005). Through avoiding the use of CHL, this protocol allows researchers to stain for plant cell death with trypan blue more rapidly and safely, substantially reducing the risk to researchers. Here we demonstrate the utility of this method by monitoring the course of infection of Col-0 leaves with Botrytis cinerea (B.c), the second phytopathogen fungus on scientiﬁc/economic importance with a broad host range, and a high capacity to produce hydrogen peroxide in plants (Rolke et al., 2004; Dean et al., 2012; Lehmann et al., 2015). This protocol has been also applied successfully to other Arabidopsis accessions. 1Note: Trypan blue is a synthetic compound derived from toluidine, invented by Paul Ehrlich, winner of the Nobel prize in Physiology and Medicine, 1904 (http://www.pei.de/). Sterilize Arabidopsis seeds with the seed sterilization solution (see Recipes) for 20 min, then wash with sterile water four times. Stratify seeds in 4 °C chamber for 2 days in darkness. Germinate seeds in a mix of 3:1 (soil:vermiculite) in the growth chamber, for 21 days under 10 h light/14 h darkness photoperiod, with a light intensity of 120 lux at 22 °C and 60% humidity. Sterilize all the material in an autoclave at 120 °C for 20 min. Put the plants into a biological safety cabinet chamber and inoculate them with one drop of 5 μl of B.c fungal inoculum (see Recipes, Figure 1A) per leave. Cover the plants with Parafilm (Figure 1B) to avoid dispersion of conidiospores and to maintain high humidity (90-100%) for optimal growth of the fungus. Return them to the growth chamber and make small holes in the Parafilm (> 10) with a yellow tip to avoid ethylene accumulation within the tray, which would activate plant defense response and stop fungal growth. Incubate the B.c-inoculated plants in a growth chamber at 25 °C under a 10 h photoperiod until the day of sampling, usually 2 to 7 days post-inoculation (Figure 1C). 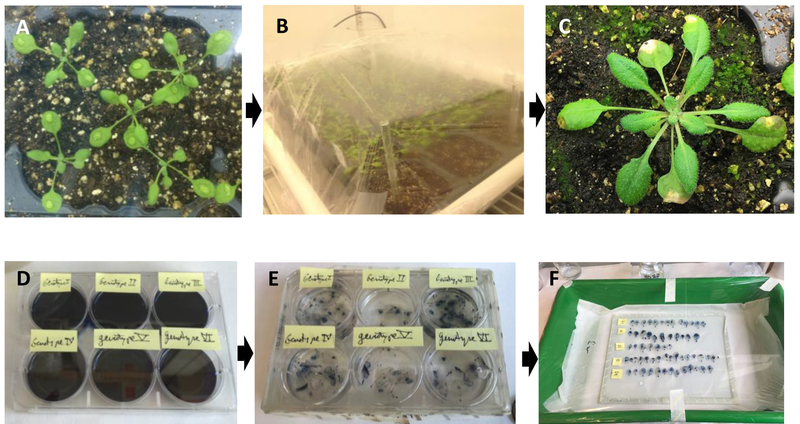 At each time-point of the experiment, harvest inoculated leaves with scissors and put them directly into plates containing 5 ml of fresh trypan blue solution (see Recipes, Figure 1D). At this point be sure that the leaves are completely immersed in the liquid; use a blue tip to submerge them if necessary. Cover the plate and wait for at least 30 min. A blue color will then be visible in the locations of dead tissue. Total staining time should not exceed 1 h. Avoid the use of boiling methods, vacuum infiltration methods or microwave treatments which will impede the later de-staining process. Note: Timing of sampling might change depending on Arabidopsis/accession/mutant/line-B.c interaction and fungal virulence. Remove the trypan solution and re-fill the plates immediately with 98-100% ethanol. Seal the plates with Parafilm in order to avoid drying that might break the leaves or fix them to the plastic plate. Leave tissue in the ethanol solution at least overnight, then using a 5 ml pipet; replace the ethanol solution with fresh ethanol, repeatedly, until green tissue has become completely colorless (Figure 1E). Remove the ethanol and cover the leaves with 60% glycerol solution. At this point, the leaves are ready to be transferred to a glass surface to be visualized with a microscope (Figure 1F). If necessary, cell death measurements might be validated by ion leakage losses using a conductometer according to Govrin and Levine (2000)* or measuring leaf death area with ImageJ software (Rasband, W.S., ImageJ, U. S. National Institutes of Health, Bethesda, Maryland, USA, http://imagej.nih.gov/ij/, 1997-2016). *Note: To measure ion leakage we followed the protocol of Govrin and Levine (2000). We used 5 inoculated or control leaves per biological replicate, and four replicates per genotype. Leaves were immersed into water for 3 h at room temperature and later conductivity was measured following manufacturer’s instructions. Total (100%) ion leakage was obtained from same samples maintained o/n at -80 °C. Data analyses were performed as is indicated below. Figure 1. Procedure of Arabidopsis leaf inoculation with B.c. A and B. Leaf surfaces of Arabidopsis lines were inoculated with 5 µl of fungus (105-108 spores/ml), and plants were transferred to a plastic tray with transparent lid to allow fungal growth. C. The progress of infection was followed until plant symptoms were observed. D. Leaves were harvested on plates and imbibed with trypan blue staining solution for no more than 1 h. E. Leaves were immersed in ethanol overnight until they were translucent. F. Leaves were transferred to 60% glycerol for microscopy purposes. Figure 2. Arabidopsis leaves with different degrees of infection. A-F. Photos taken immediately after cutting leaves from plants grown on soil. G-L. Photos of representative leaves stained with trypan blue, exhibiting levels of infection similar to the leaves shown above. Bar = 0.5 cm. For all experiments at least ten leaves per ecotype are sampled to be stained. Experiments are repeated at least four times. When necessary, the stained leaf surfaces were measured with the software ImageJ (Particle Analysis, Surface Plot, and Measure Tools, following the user guide of ImageJ, https://imagej.nih.gov/ij/docs/pdfs/examples.pdf). Leaf ion leakage data were analyzed with the Statgraphics Centurion XVI.II software (StatPoint Technologies, Inc. www.statgraphics.com). Unifactorial analyses of variance (ANOVA) tests were performed, calculating the mean and standard error as well as Duncan’s comparison of means for a confidence level of 0.05%. Note: Store the solution at room temperature into a ventilation hood and always use fresh solutions. The Botrytis strain was grown at 28 °C on PDA medium plates (potato dextrose agar, Difco, Detroit, MI , USA) for eight days under darkness, and spores were collected in sterile water and stored in 20% glycerol at -80 °C until use. *Note: The stock of the fungi should be preserved at -80 °C in 20% glycerol in order to avoid virulence loss caused by repeated growing of the fungus on plates. The final concentration of the fungus will depend on the virulence of the fungal isolate usually between 105-107 spores/ml. Fungal concentration (conidiospores per ml) is measured using a hemocytometer (http://www.hemocytometer.org/). When the B.c isolate has low virulence, or when high levels or rapid fungal growth are required, the inoculation may be performed in presence of potato dextrose broth medium (PDB) using the maximum dilution of PDB possible, adding the same concentration of PDB to control inoculated leaves. This protocol was modified from Keogh and collaborators (1980). We acknowledge M. Wilkinson from CGBP for his contribution. The research leading to these results received funding from No. AL13-P(I+D)-05, No. AL14- PID-26 to Domínguez J.A, and Berrocal-Lobo M, from RTA2013-00027-00-00 to Castellano M. M, and Berrocal-Lobo M.
Cooksey, C. J. (2014). Quirks of dye nomenclature. 3. Trypan blue. Biotech Histochem 89(8): 564-567. Dean, R., Van Kan, J. A., Pretorius, Z. A., Hammond-Kosack, K. E., Di Pietro, A., Spanu, P. D., Rudd, J. J., Dickman, M., Kahmann, R., Ellis, J. and Foster, G. D. (2012). The Top 10 fungal pathogens in molecular plant pathology. Mol Plant Pathol 13(4): 414-430. Gelder, M., Mayou, R. and Geddes, J. (2005). Psychiatry (3rd). Oxford pp: 238. Govrin, E. M, and Levine, A. (2000). The hypersensitive response facilitates plant infection by the necrotrophic pathogen Botrytis cinerea. Curr Biol 10(13): 751-757. Lehmann, S., Serrano, M., L'Haridon, F., Tjamos, S. E. and Metraux, J. P. (2015). Reactive oxygen species and plant resistance to fungal pathogens. Phytochemistry 112: 54-62. Lu, J. and Greco, M. A. (2006). Sleep circuitry and the hypnotic mechanism of GABA drugs. J Clin Sleep Med 2(2): S19-26. Rolke, Y., Liu, S., Quidde, T., Williamson, B., Schouten, A., Weltring, K. M., Siewers, V., Tenberge, K. B., Tudzynski, B. and Tudzynski, P. (2004). Functional analysis of H(2)O(2)-generating systems in Botrytis cinerea: the major Cu-Zn-superoxide dismutase (BCSOD1) contributes to virulence on French bean, whereas a glucose oxidase (BCGOD1) is dispensable. Mol Plant Pathol 5(1): 17-27. Salazar M, Peralta C, Pastor F. J. (2009). Tratado de Psicofarmacología. 2 Ed. Panamericana. Salmon, A. G., Kizer, K. W., Zeise, L., Jackson, R. J. and Smith, M. T. (1995). Potential carcinogenicity of chloral hydrate--a review. J Toxicol Clin Toxicol 33(2): 115-121. Silverman, J, and Muir, W. W., 3rd (1993). A review of laboratory animal anesthesia with chloral hydrate and chloralose. Lab Anim Sci 43(3): 210-216. How to cite: Fernández-Bautista, N., Domínguez-Núñez, J. A., Moreno, M. C. and Berrocal-Lobo, M. (2016). Plant Tissue Trypan Blue Staining During Phytopathogen Infection. Bio-protocol 6(24): e2078. DOI: 10.21769/BioProtoc.2078. Hi, I am using a TRV-based virus expression system to express in Nicotiana benthamiana. Necrosis can be clearly seen. But according to the protocol, necrosis area cannot be dyed blue.How to solve this problem? Thank you! This protocol has been used several times with Arabidopsis leaves infected with different fungi, but some users working with tobacco infected with virus showed that trypan blue solution needs higher concentrations for staining necrosis areas. Probably virus infect vascular tissue areas more difficult to stain than necrotic leave areas. I would suggest to stain leaves of younger plants or stain leaves during longer periods and at higher concentrations. Please let me know about your results in order to add them to notes about the article. I never had problems, but with Arabidopsis leaves. Hi, I am doing trypan blue staining in Nicotiana benthamiana according to the protocol. In the Recipe of staining buffer it says that the final concentration of trypan blue is 10 mg/ml (1%), however 40 mg of trypan blue resolved in the liquid mixture makes a concentration of 1 mg/ml (0.1%). Which concentration should be used? You can try with 0,04g in 40ml of mix, this is the minimum for Arabidopsis leave staining, however with Nicotiana you might need more, the leaves are thicker. Let me know your results. I will review the text to fix some error. We observed with Nicotiana sometimes some whitering on leaves during ethanol step.